As you maybe aware, one of the worst hurricane to strike the Los Cabos area of Mexico hit this community on September 15th with devastating results. Sandos Finnisterra hopes to be able to reopen in early October. 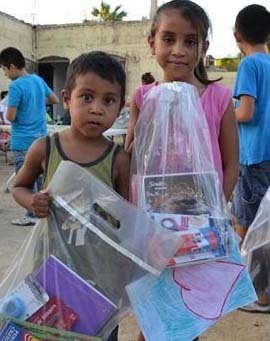 Now more than ever, they will need supplies for the community project they support. Please be sure to bring as many supplies from their needs list as possible. Companies often reward their outstanding employees with travel. An employee from Merck contacted me after hearing my radio interview on NPR because she was receiving such a trip to Los Cabos, Mexico. She wanted to Pack for a Purpose and involve as many people in the company as possible. While the accommodation she was staying at was not on a participant in Pack for a Purpose, we connected Merck’s event planner with the amazing accommodation on our website in Los Cabos, Sandos Finisterra Los Cabos. This resulted in hundreds of pounds of supplies being delivered for Unidos por Ayudar, the project Sandos Finisterra Los Cabos supports. This project helps both schools and shelters. 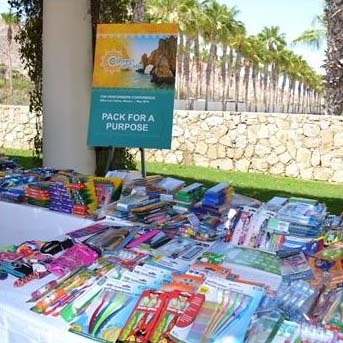 Many children started the 2014 school year with joy having received supplies they could not afford through the generosity of Merck’s employees in Sandos Finisterra Los Cabos. Companies that Pack for a Purpose as part of their reward travel make the experience rewarding for both the traveler and the communities they visit.